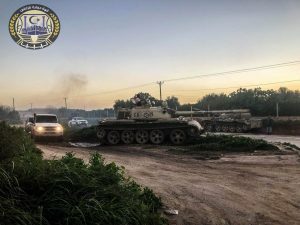 A tank belonging to the PC-aligned militia coalition, the TPF, in a field near Gaser Ben Ghashir during yesterday’s south Tripoli militia fighting (Photo: TPF). The death toll and injuries rose in the south Tripoli militia fighting yesterday as the Tripoli-based and Tripoli government-recognized militias seem to have repulsed their adversaries, the Tarhuna-based militias, south and to the other side of the Tripoli International Airport site and Gaser Ben Ghashir. At the time of writing, the Tripoli Ministry of Health had reported 2 new deaths and 11 injured in yesterday’s fighting. This brings the total since fighting resumed to 8 dead (4 fighters, 3 civilians, 1 unknown) and 49 injured (45 fighters, 4 civilians). During the day tanks were seen heading towards conflict zone. Random shelling reported by Libyan media with a school being hit in Gaser Ben Ghashir. Yesterday, in separate statements, both sides blamed each other, the Presidency Council and UNSMIL for the resumption of fighting. The 7th Infantry Kani Brigade from Tarhuna said that despite its total adherence in the past period to the agreed Zawia ceasefires signed last year with the Serraj Presidency Council and Government of National Accord brokered by UNSMIL, it deplored and blamed UNSMIL (as broker) for the actions of the (Tripoli) aggressor militias on their positions. It based this on the fact that, what it called, “aggressor” militias being encamped in the capital and the militias based in the Wirshafana region, whose corruption is responsible. It also called on all residents of the al-Sibaa, Souq al-Sibt, Gaser Ben Ghashir and Khalat al-Furjan and its surrounding areas to cooperate with the brigade’s forces and contribute to securing their areas and taking care and vigilance as their areas are a military area of operations. Meanwhile, in a lengthy statement, the Tripoli Protection Force (TPF) launched an attack on not only the Tarhuna militias it is fighting, but also on Faiez Serraj, his Interior Minister Bashagha and the whole Presidency Council (PC). The TPF did not like Bashagha referring to them as “militias”, but saved their most startling attack to Faiez Serraj by engaging in the political divisions of the PC, by declaring that they no longer recognize Serraj’s decisions unless they are reached unanimously, as specified in the Libyan Political Agreement (LPA). The TPF are taking advantage of the open political split within the PC. Earlier this month, Deputy PC member Ahmed Maetig called on Serraj to cease acting unilaterally and to take decisions through unanimity with the other eight PC members – as prescribed by the LPA. The split within the PC and the attack upon their legitimacy by the TPF is also taking advantage of the attempt by the House of Representatives (HoR) and High State Council (HSC) to restructure the PC. In reality, this means replacing Faiez Serraj. It may also strengthen the hand of the HoR and HSC against Serraj, UNSMIL and the international community. The latter are working on the basis that any political change could disrupt any hard earnt Libyan stability they have eked out in recent years. The TPF also accused what they referred to as the “so-called Seventh Brigade militias” , which they said is of unknown origin as it had been dissolved by the PC, of resuming the fighting and renewing their “crimes” in the capital against its residents, facilities and installations, after committing “massacres” that the TPF “thought would not go unpunished” between the month of August and September (2018). The TPF said that they had also “followed the official and shaky” reactions to the (Tarhuna) militia’s new aggression in recent days, while the TPF has grappled with this aggression with valor, courage and efficiency. The TPF said that several questions are raised and need to be answered urgently as a result of the repeated attacks of this alleged brigade and its militias that are outside the scope of legality and the law, and the reactions around it. It asked: who is benefiting from their attacks and assaults? Where are they receiving weapons and (financial) support from? What is the identity and ideology of the fighters in their ranks? And who are the political and military personalities from Libya and beyond that stand behind them? Referring to the decison by Faiez Serraj in his capacity as the Supreme commander of the (Tripoli-based) Libyan Army of 2 April 2018 (No. 79/2018) on the dissolution of the 7th Infantry Kani Brigade brigade, and in addition to the “war and the massacres” committed by the 7th Brigade in the past period, the TPF said they were surprised by Interior Minister Bashaga’s decision to takeover the protection of the Tripoli International Airport area. The implication was that he neither consulted them nor did he have the capacity or ability to secure the location. Moreover, they criticised him of constantly “singing” the need for Tripoli militias to vacate state institutions. The implication by the TPF again is that if Bashagha had left the Tripoli militias (TPF) to continue to protect the airport area, they would have been able to defend it or that the Tarhuna brigade would not have attacked. This move by Bashagha, they added, is in stark contrast to what is happening, and in flagrant contravention of the the two Zawia ceasefire agreements and of the Security Arrangements as a whole. The TPF said that there are specific and clear parties involved in the war on Tripoli from their positions of responsibility within the PC and its Government of National Acccord, which the TPF had entered under its legitimacy since the first day of its arrival in Tripoli, in its desire to reunite Libyans. The TPF, therefore, concluded that since there are “parties within the Presidential Council that have double standards and support the advocates and supporters of war for various reasons, including internal, external, international and self-interest”. And “in view of the confusion in which UNSMIL and its political and security plan for Libya are sinking in”, the TPF declare that it shall only obey this “conflicting” Presidency Council when it is united and issues its decisions (unanimously) with its full nine members” and “until the election of a head of state and a legislative authority”. Otherwise, the TPF said they considered what happens and what will happen to be planned destabilization on: the capital and its people in particular and on the people of Libya in general. They concluded by demanding that the PC clarify its position clearly on events and that they name things for what they are.